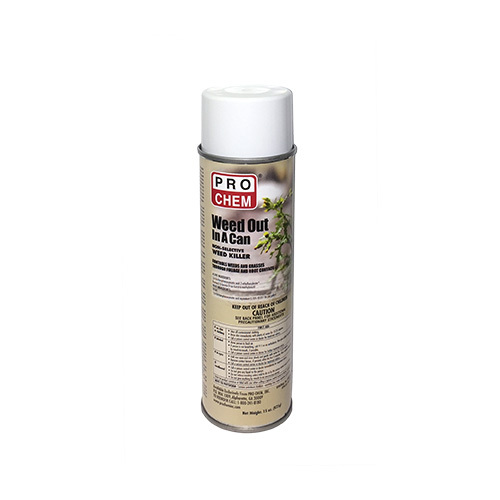 WEED OUT IN A CAN | Pro Chem, Inc.
WEED OUT IN A CAN is a solvent-based, non-selective weed killer that offers not only immediate burndown through the plant’s foliage but also season-long residual control. 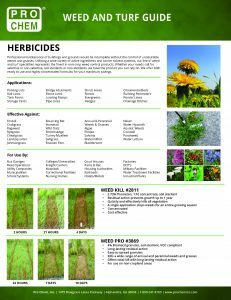 Designed for use on non-cropland areas, best results will be obtained when applied in late spring or early summer and when predominant species are well established. Weed control results vary depending on the amount of product applied, the type of soil and rainfall in the area. Product can be applied year round except when the ground is frozen. Remove protective cap. Invert can and point opening in spray tip towards weeds to be sprayed. Depress the tab on the side of tip and spray weeds thoroughly. Coverage: To control most weeds for an extended period of time on non-cropland areas, apply at the maximum rate of 1 can per 174 square feet per application. Limited to 2 applications per year.